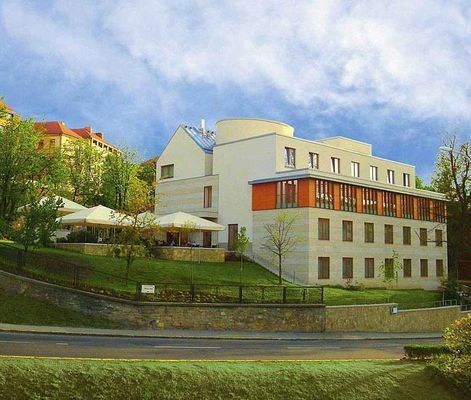 The Hotel Castle Garden**** lies in the 1st district of Budapest, near to the famous tourist attraction of Buda Castle. 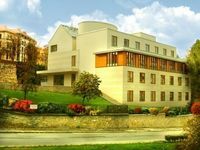 The location of the hotel provides a cosy and silence place where the tourists can enjoy the vicinity of the nature in the heart of a teeming city. Our newly-built four star hotel which provides 38 air-conditioned hotel-rooms, a unique style restaurant with garden, lobby bar, a refresshing mini-wellness center and garage, is an ideal venue both for the tourists and the corporate clients. We take outstanding care of the comfort of the non-smoking guests: uniqually all the guest-rooms and the public areas in the hotel are non-smoking. • Breakfast is not included in room rates. It is available at 9 EUR per person. • Half board is available at 12 EUR per person. The rates include the VAT tax, but do not include the breakfast. Breakfast can be ordered as an extra for 7.50 Euro/person.